Duke University is a private university in Durham, North Carolina, founded in 1838. It was formed by Methodists and Quakers in the present-day town of Trinity. The school moved to Durham in 1892. It has advanced research. Some famous people including former President of the United States, Richard Nixon went to the school. In its 2012 edition, U.S. News & World Report ranked the university's undergraduate program 10th among national universities. Duke has good libraries, such as Bostock Library. It also has a famous medical school and law school. The school's colours are blue and white and its president is Richard Brodhead. Duke University owns 220 buildings on 8,610 acres ([convert: unknown unit]) of land. This includes the 7,200 acres (29 km2) Duke Forest. Duke has 26 varsity sports teams, known as the Blue Devils. Duke's athletic programs are considered among the very best in the NCAA. Duke's teams play in the Atlantic Coast Conference. Its Men's Basketball Team under coach Mike Krzyzewski has won the NCAA Tournament four times, and bought out the 2015 title as well. In football The Blue Devils have won seven ACC Football Championships. They have had ten players honored as ACC Player of the Year (the most in the ACC), Duke's teams play in the Atlantic Coast Conference. ↑ King, William E. "Shield, Seal and Motto". Duke University Archives. Retrieved July 6, 2011. ↑ "About – Duke Divinity School". Duke Divinity School. Retrieved July 4, 2011. ↑ "Duke University's Relation to the Methodist Church: the basics". Duke University. 2002. Retrieved 2010-03-27. 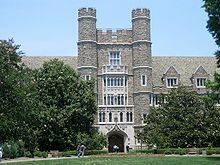 Duke University has historical, formal, on-going, and symbolic ties with Methodism, but is an independent and non-sectarian institution...Duke has much in common with other Methodist related schools such as Northwestern, Syracuse, Vanderbilt, or the University of Southern California. Each is unique, and Duke would not be the institution it is today without its ties to the Methodist Church. However, the Methodist Church does not own or direct the University. Duke is and has developed as a private non-profit corporation which is owned and governed by an autonomous and self-perpetuating Board of Trustees. ↑ As of June 30, 2011. "Duke University's Endowment" (article). Duke Univ. Archived from the original on 2012-03-01. Retrieved February 9, 2011. ↑ 5.0 5.1 5.2 5.3 5.4 5.5 "Quick Facts about Duke". Duke Office of News & Communications. Archived from the original on 2012-06-05. Retrieved December 27, 2011. ↑ "The origin of Duke Blue". Duke University Archives. Retrieved August 3, 2011. ↑ "A Chronology of Significant Events in Duke University's History". Duke University Archives. Archived from the original on 2012-03-01. Retrieved May 23, 2011. ↑ Richard M. Nixon. The White House.'.' Retrieved July 25, 2011. ↑ America's Best Colleges 2011. U.S. News & World Report, 2010. Retrieved on August 17, 2010. ↑ America's Best Graduate Schools 2009. U.S. News & World Report, 2009. Retrieved on April 23, 2009. ↑ All-Time Winningest Teams. NCAA, 2009. Retrieved June 28, 2011. ↑ "ACC Champions" (PDF). 2007 Atlantic Coast Conference Media Guide (Atlantic Coast Conference): 93. 2007. http://grfx.cstv.com/photos/schools/acc/sports/m-footbl/auto_pdf/07fbguide093096.pdf. Retrieved January 13, 2011. This page was last changed on 9 March 2019, at 01:11.